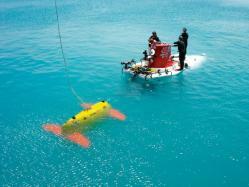 Scientists and engineers from the Woods Hole Oceanographic Institution (WHOI) and the University of Washington (UW) have successfully completed the first scientific mission with Sentry, a newly developed robot capable of diving as deep as 5,000 meters (3.1 miles) into the ocean. The vehicle surveyed and helped pinpoint several proposed deep-water sites for seafloor instruments that will be deployed in the National Science Foundation's (NSF) Ocean Observatories Initiative (OOI). Working in tandem with sonar instruments on the UW-operated research vessel Thomas G. Thompson and with photo-mapping by WHOI's TowCam seafloor imaging system, Sentry gathered the most precise maps to date of seafloor features known as Hydrate Ridge and Axial Volcano, around the edges of the Juan de Fuca tectonic plate off the coast of Oregon and Washington. Two nodes of a pioneering deep-ocean observatory are being planned for those locations. "We are changing the way ocean science is done, launching a new era in which an ensemble of technologies will provide us with an increasing capacity for exploring and interacting with the global oceans," said John Delaney, chief scientist of the expedition and principal investigator for the UW-led regional observatory in the OOI. "Robot mappers are helping design the new and transformational infrastructure to accomplish that change. That new infrastructure will empower the next generation of robots to go far beyond the current autonomous mappers." The one-of-a-kind, WHOI-built AUV-which was largely funded by NSF – made six dives during the July 22 to August 5 expedition. Sentry surveyed 212 linear kilometers of seafloor, or about 53 square kilometers, as it traced parallel lines like a lawn-mower making a pattern across a yard." 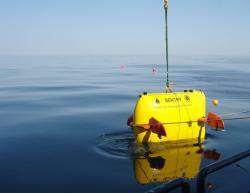 Sentry had a very successful introduction," said Dana Yoerger, the lead WHOI engineer for Sentry. "We had tested the AUV as best we could before we got out here, but the steep terrain of the deep sea is quite a different matter. Our engineering team and our vehicle all performed very well under the stresses of putting a complex system into the ocean for the first time." "Sentry has given us a survey with great precision and resolution," said Delaney. "These maps will help with the installation of the primary nodes of the networked observatory on the Juan de Fuca tectonic plate." Powered by more than 1,000 lithium-ion batteries-similar to those used in laptop computers, though adapted for extreme pressures - Sentry dove for as long as 18 hours and 58 kilometers, with the potential for longer trips in the future. "We chose the body shape, the tilting foils, and the location of the thrusters to give Sentry a favorable combination of maneuverability over a wide range of speed, as well as hydrodynamic efficiency," said Yoerger. "Sentry is a true robot, functioning on its own in the deep water," said Rod Catanach, a WHOI engineer who works with Sentry. "The vehicle is completely on its own from the time it is unplugged on the deck and cut loose in the water. We can send a few simple commands, but there is no room to micromanage." With this mission successfully completed, Sentry is now ready to join the National Deep Submergence Facility (NDSF), a federally funded center based at WHOI that operates, maintains, and coordinates the use of vital deep ocean vehicles for the U.S. oceanographic community. Sentry will replace the Autonomous Benthic Explorer (ABE), Sentry's predecessor in the NDSF and a pioneer in deep-diving vehicle operations since 1996. "Sentry's niche will be the ability to run many types of dives, from long missions high in the water column to detect hydrothermal vent plumes to bathymetric mapping dives closer to the seafloor to close-up bottom photography in rugged terrain," Yoerger added. "Sentry can be outfitted with a variety of instruments, and without those instruments being tightly integrated into the vehicle." On its first scientific mission this week, Sentry carried a multibeam mapping sonar, a water conductivity and temperature (CTD) probe, an optical backscatter sensor (to detect cloudy water), two magnetometers, and a sensor for detecting water chemistry related to hydrothermal vents, in collaboration with Ko-Ichi Nakamura of Japan's National Institute of Advanced Industrial Science and Technology.